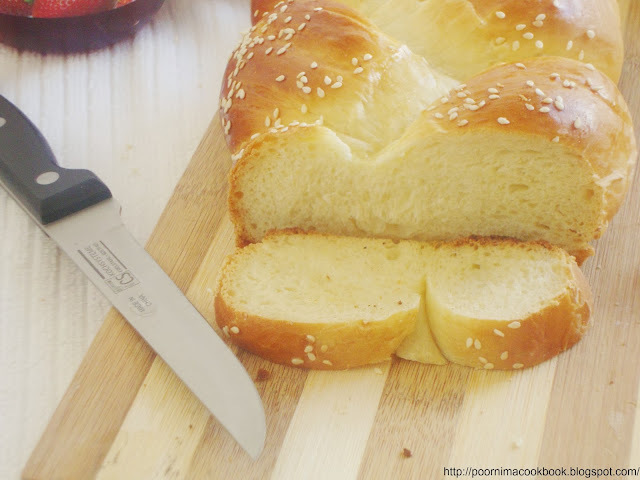 Hi friends, here is Jewish Challah Bread for December month's Home Baker's Challenge. This month Priya Ranjit of Cook Like Priya is hosting the event and she has selected Christmas Bakes as the theme for this challenge. 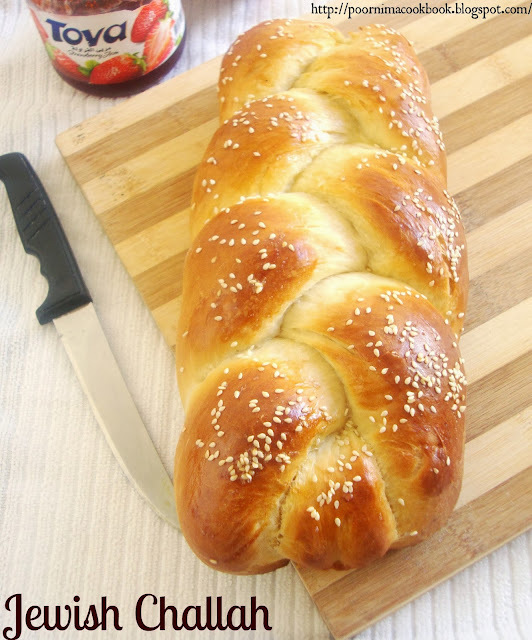 Though she had suggested recipes of cookies, breads and cakes, this Challah Bread was the one which attracted me a lot! Preparing bread at home was quite interesting and every one liked it as well. Even beginners can try this without second thought. This recipe is adapted from thekitchn. This is a Jewish yeast - risen egg bread, traditionally eaten by Jews on Shabbat, on ceremonial occasions, new year, Christmas and other festivals. It is often braided for a beautiful presentation and sprinkled with sesame or poppy seeds for special touch. In a large bowl, sprinkle yeast, little sugar and warm water; allow it to stay until frothy for about 5 minutes. This means yeast is active and ready to use. 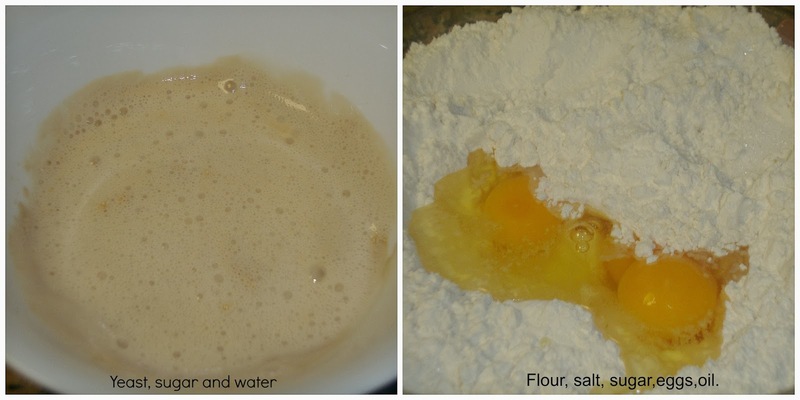 Take a large bowl add 4 cups of the flour, sugar and salt. Make a well in the center of the flour and add the eggs, egg yolk and oil. Whisk these together to form a slurry. 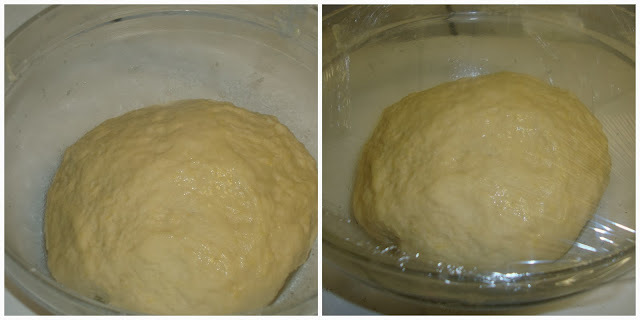 Add in the yeast mixture and start mixing to form a soft dough. Add more water, if necessary. Turn out dough onto lightly floured surface; knead until smooth and elastic, for about 10 minutes, adding enough of the remaining flour as necessary to prevent sticking. Shape into a ball and set in a slightly oiled bowl. Cover it with the plastic wrap and keep it in a warm place; allow it to rise until doubled in volume for about 1½ to 2 hrs. 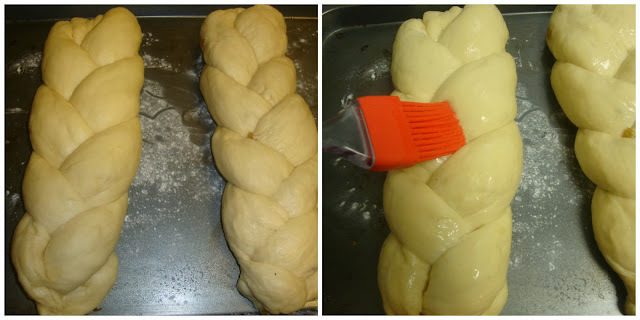 Once it is raised divide the dough into three or six equal pieces, depending on the type of braid you'd like to do. 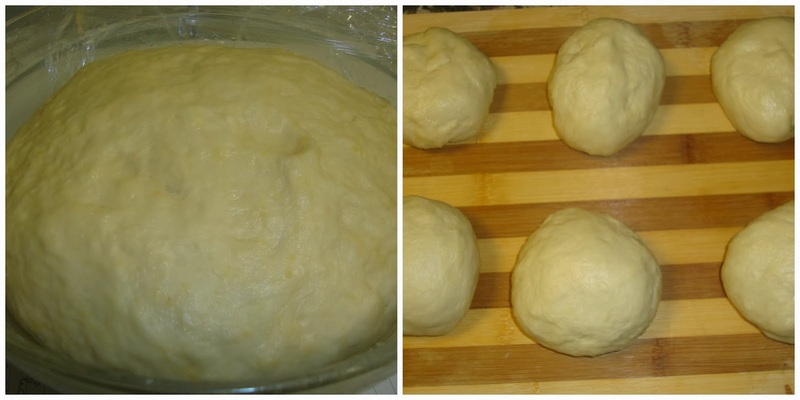 Roll each piece of dough into a long rope roughly 1-inch thick and 16 inches long. If the ropes shrink as you try to roll them, let them rest for 5 minutes to relax the gluten and then try again. Gather the ropes and squeeze them together at the top. 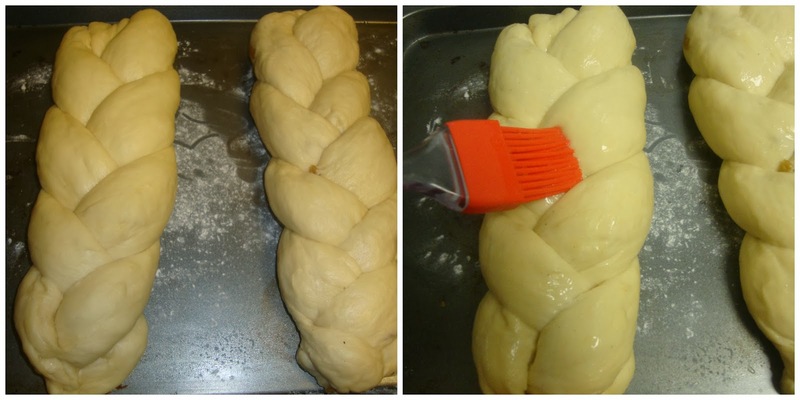 If making a 3-stranded challah, braid the ropes together like braiding hair and squeeze the ends together when complete. Grease baking trays or lined with parchment paper and place the finished braid. Cover it with towel and let rise until puffed and pillowy, about an hour. Beat the egg white and brush a generous quantity over each braid. Sprinkle with sesame or poppy seeds as desired. Be sure to apply in the cracks and down the sides of the loaf. Bake at 180 degrees C for about 30-35 minutes, rotating the pan halfway through cooking. The challah is done when it is browned evenly. To test if it is done, tap the bottom of the loaf with your fingers; It should sound hollow. Transfer to a rack to cool thoroughly before slicing and serving. 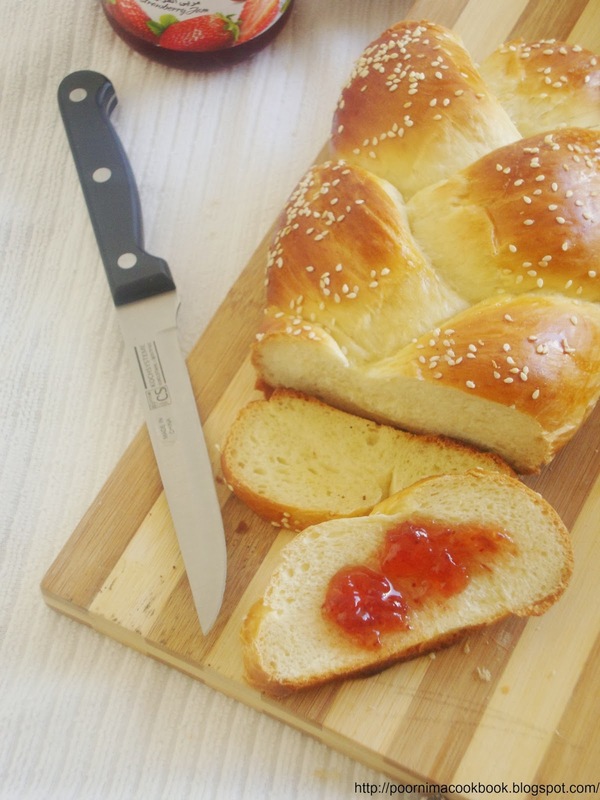 Serve this delicious soft bread with your favorite jam, nutella or any sandwich spread. The baking temperature and time will vary depending on the oven specification and bread's thickness. 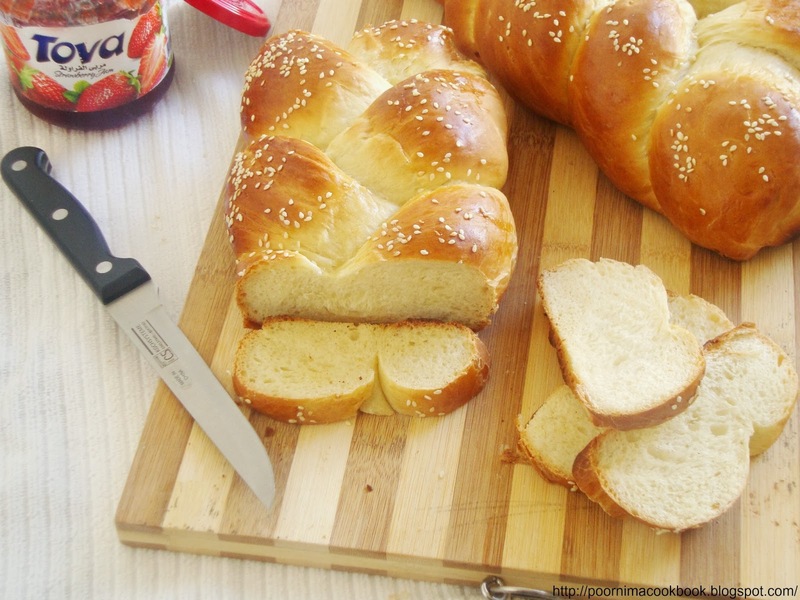 You can use the left over challah bread to prepare french toast or bread pudding. Thank you gayathri for visiting my space. You made a beautiful challah. We eat challah weekly and yours looks better than what I am used to. It is humorous though to see challah for the Christmas edition since Jewish people do not observe the holiday. I tasted the bread. Was too soft and lovely. Best bread. Thanks poornima. very perfect bread, love it to core!! !